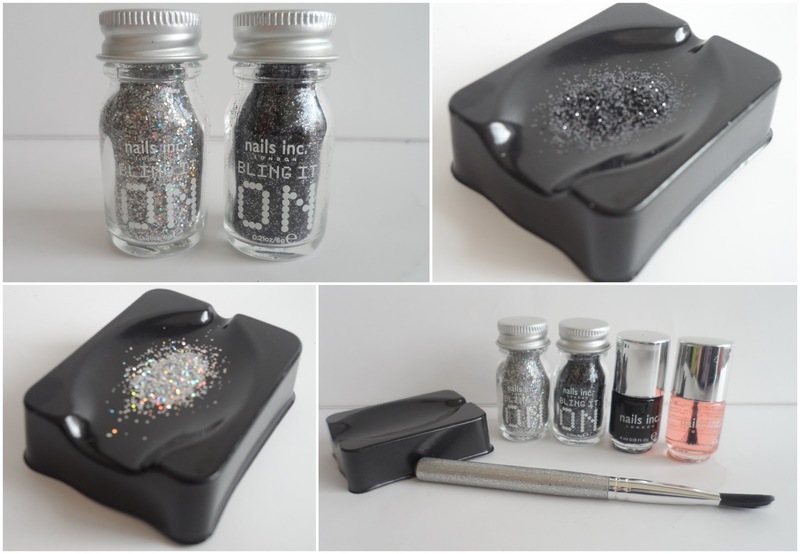 Get ready for a glitter-fest - this is no ordinary nail polish gift set! Nails Inc Bling it on rocks has given me the sparkliest nails I've ever had - it also covered me and my carpet in so much glitter like you'd think I'd been out slaughtering fairies, but that was down to my general clumsiness and was nothing the hoover couldn't sort out. The kit comes with two bottles of glitter - one is a sliver rainbow sparkler and the other is black with little shimmers of silver. You also get a mini Black Taxi polish and a mini Kensington Caviar top coat. There are also a couple of tools to help you apply the glitter - a little tray for pouring out the glitter and rolling your nails around in, and a brush to get rid of the excess glitter which might cling to your skin. I started off by applying a base coat as I didn't want to risk the black polish staining, before applying a coat of black taxi one nail at a time. Directly after applying the black polish - so while it's still wet - you lay your nail into the glitter on the tray and gently roll it around to get a good coating all the way to the edges. Once covered I pressed down on the glitter to make sure it was stuck on well and then set about neatening up the edges with the brush. This is how the glitter looked straight after application - pretty amazing right? You can really see the texture and the sparkle from the silver glitter is insane. I'm a bit of a perfectionist so I did get annoyed at my not so straight edges and little bits of glitter on my skin, but glitter gets everywhere and you just can't prevent it. Luckily after you're all done and you've washed your hands the loose glitter disappears and you have a much neater result. I wish I could have just left the nails as they were, but you do have to apply the topcoat unless you want to lose your main pretty quickly and sprinkle glitter on all that you touch. The top coat unfortunately takes away some of that really cool texture, but you still get the awesome sparkle. Also I started to slightly see the black base coat through the silver glitter, so next time I'd probably use a silver polish for the base colour. Before I tried this kit I'd read another blogger say that nobody would know you'd used anything other than just a regular glitter nail polish, but I completely disagree. I've never achieved a result as sparkly as the silver Bling it on Rocks with any glitter nail polish. Somebody asked me if you could get the same result by using glitter you can buy in hobby shops. I'm really not sure - I don't now how normal glitter would hold up under a polish top coat, but I'm too lazy to try it - I'd much rather use a set where everything's been worked out for me and I have all the little tools I need. My super sparkly glitter manicure lasted two days, which is a whole day longer than I was expecting. Whenever you use a texturised product on your nails you know it's not going to be super-hardwearing as there are just so many opportunities for it to catch and chip when going about your business. It lasted a day longer than any of my caviar bead manicures, so it certainly gets points for that, and I think it's perfect for one night blingtastic party nails. The Bling it on range from Nails Inc also includes two other sets - Bling it on hologram and Bling it on midnight which are the same concept but feature different shades of glitter. I can't find any swatches of these online yet, so please link me if you have some. The hologram one looks particularly interesting to me but it's hard to tell just from the images. Will you be blinging it on? The silver one is bloody amazing! So sparkly! Woooooooooooooooow!!! These are STUNNING! Glitter nails are my faves, I especially love the silver one. Holographic glitter always looks amazing. The regular nails I have right now are so dull in comparison! The boyf literally hoovered me! These look amazing! I don't own many nails inc polishes but definatly want to try these out!! So cool! But how do you remove this? This looks amazing! I have to get this!